Adam Blumer is the author of two suspense novels, Fatal Illusions (Kregel) and The Tenth Plague (Kirkdale Press). A print journalism major in college, he works full time from home as a freelance writer and editor after serving in editorial roles for more than twenty years. He lives in Michigan’s Upper Peninsula with his wife, Kim, and his daughters, Laura and Julia. 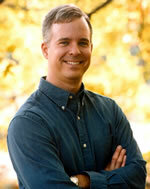 Adam is a member of the American Christian Fiction Writers, Writer . . . Interrupted, the Christian Fiction Blog Alliance, the Christian Editor Network, the Christian Pen, and The Writers View.